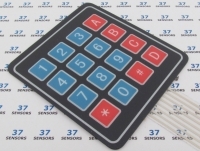 “37 Sensors” is the common name for a number of kits of small electronic modules. Not all of the kits have 37 modules in them – some have more, some less. Also, although a large number of these modules are what would be considered “sensors”, some are certainly not sensors (things like RGB LEDs and relays). If you are curious as to how to interface to these common modules, this site has interface information and example code for morethan 37 of these modules. If you have questions or more information to share, please comment on the module page. If you have created a project using a certain module, it would be nice to hear about that, too! Returns an analog signal based on the intensity of a magnetic field. Module outputs the analog sensor signal, as well as (for some modules) a digital signal that is switched high when the sensor level crosses a preset threshold. The threshold is set via the potentiometer. Also called: joystick, mini dual axis joystick, KY023. A joystick made from two typically 10k potentiometers at right angles to each other. Analog output in both x and y directions. Push knob down for momentary switch. 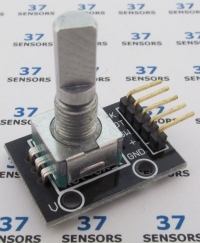 Also called: temperature sensor, thermistor, KY013. 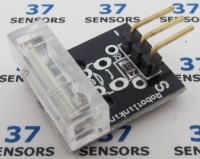 A thermistor used for temperature sensing. Analog output. Also called: tilt switch, KY020. A metal ball that closes contacts when tilted. Also called: two color LED, red/green LED, mini two color, dual light LED, KY011, KY029. A red and green LED emitter in a single package. Both controlled independently. Can use PWM on each LED to mix yellow-orange colors. Some modules have current limiting resistors, some do not. Also called: momentary button, key switch, KY004. A detector that outputs a digital state based on the presence of a flame or fire. Can be used for fire detection. Module outputs the analog sensor signal, as well as a digital signal that is switched high when the sensor level crosses a preset threshold. The threshold is set via the potentiometer. 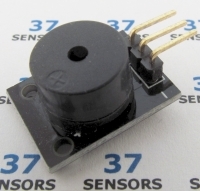 Also called: magnetic field sensor, KY003. Detects the presence of a magnetic field. Digital on/off output. Can differentiate between north and south magnetic poles with front or back of the sensor. 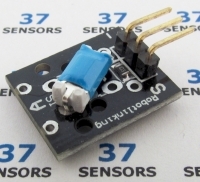 Also called: humidity sensor, DHT11, KY015. DHT11 digital (protocol) device that measures humidity and temperature. Also called: infrared receiver, remote receiver, KY022. 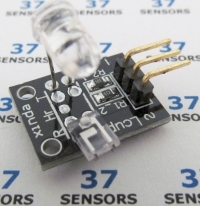 Infrared sensor. Will demodulate the signal from a 38kHz carrier. Also called: IR emission, infrared transmitter, KY005. An array of buttons (keypad). Also called: magic cup, KY027. A mercury switch paired with an LED. Also called: water detector, rain detector, moisture sensor, soil sensor. Detects liquids that conduct electricity. Also called: tilt switch, quicksilver switch, KY017. A small glass vial with two contacts and a bit of mercury inside. Acts as a tilt switch. Also called: sound sensor, big sound, small sound, microphone big, microphone small, microphone sensor, KY037, KY038. 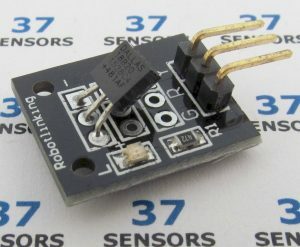 A module that uses a high sensitivity electret microphone to detect sound. Module outputs the analog sound signal, as well as a digital signal that is switched high when the sound level crosses a preset threshold. The threshold is set via the potentiometer. Also called: 7 color flash, autoflash LED, polychrome flash, KY034. An LED that flashes through a sequence of seven multiple colors. 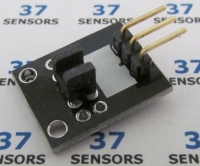 Also called: infrared avoiding, wall sensor, reflective sensor, KY032. A phototransistor and infrared LED pair for the detection of an obstacle. Can be used for robotics. The detection distance is about 1/4 of an inch. An enable input to the module enables or disables the circuitry. Also called: slot sensor, notch sensor, light block sensor, KY010. An LED and a phototransistor that detects an object in the slot between the LED and detector. 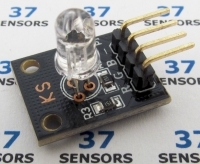 Also called: light detector, optosensor, KY018. A resistor that changes resistance based on light level. Also called: active buzzer, KY006. Piezo or small speaker that generates a fixed tone. This is a piezo element along with a fixed frequency driver circuit. Also called: heartbeat sensor, KY039. An infrared LED and photodetector/phototransistor pair used to detect pulse/heartbeat through a fingertip. Also called: magnetic spring switch, mini reed switch, KY025. A switch that closes in the presence of a magnetic field. Module outputs the analog sensor signal, as well as (for some modules) a digital signal that is switched high when the sensor level crosses a preset threshold. The threshold is set via the potentiometer. Also called: full color LED, three color LED, trichromatic LED, KY021, KY016. Also called: Incremental encoder, KY040. Digital output and continuous rotation detection. A geared motor that turns 180 degrees based on a pulsed input. Also called: tap sensor, knock sensor, shake sensor, percussion sensor, spring switch, vibration sensor, impact sensor, KY002, KY031. 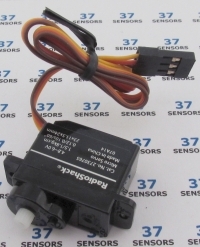 The sensor is designed to act as a switch. Detects tapping/knocking or vibration. Also called: relay, one-channel relay, KY019. 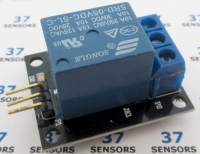 A driver circuit and single 5V relay that can control greater voltages/currents. Can make a direct connection to the microprocessor as this board has a relay driver circuit to drive the relay coil. Contacts typically rated for 10 amps. 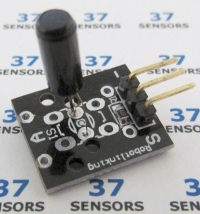 Also called: passive buzzer, non-sctive buzzer, piezo speaker, KY012. Speaker or piezo for sound output. Also called: 18B20 one-wire, KY001. 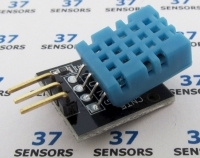 Digital (1-wire communication bus) temperature sensor. Also called: digital temperature, thermostat module, KY028. 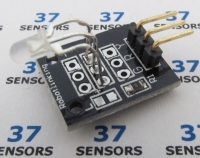 A thermistor module that outputs a digital level based on a temperature threshold. Module outputs the analog sensor signal, as well as a digital signal that is switched high when the sensor level crosses a preset threshold. The threshold is set via the potentiometer. 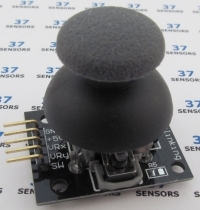 Also called: metal touch sensor, KY036. Touching a contact on this module is detected and results in a changed output. Module outputs the analog sensor signal, as well as a digital signal that is switched high when the sensor level crosses a preset threshold. The threshold is set via the potentiometer. Also called: infrared tracking, optical tracking, tracking sensor, line follower, hunt sensor, KY033. 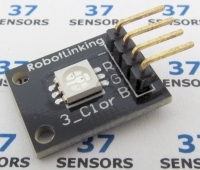 A tracking or “line following” infrared LED and phototransistor module. 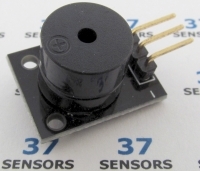 The sensor is an IR emitter adjacent to an IR receiver. 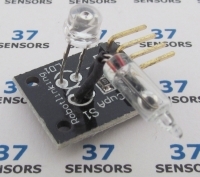 Reflection of the IR signal (an object in front of the sensor) will cause the digital out signal to go low. Detection distance is typically about a half inch. Sensitivity can be adjusted with the potentiometer.